Befriend is a Perth-based social enterprise founded by WA Volunteer of the Year finalist, Nick Maisey. Founded in 2010, Befriend focuses on social inclusion and creating meaningful relationships. Befriend has welcomed over 5000 members to their diverse and caring community. 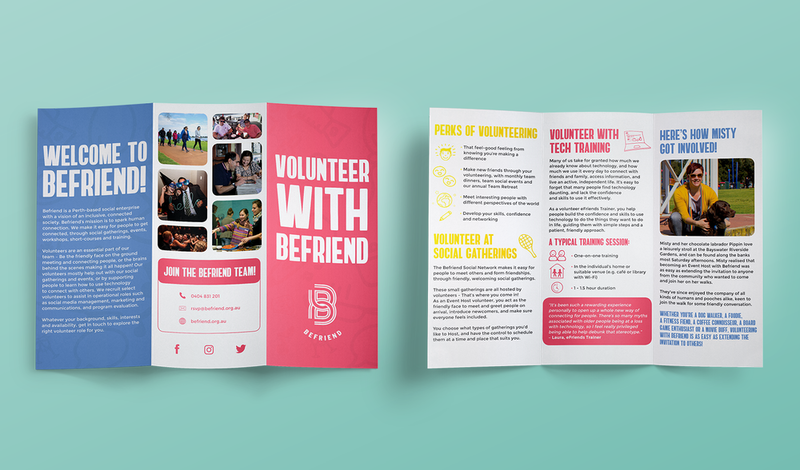 As Befriend continues to grow bigger, they were looking to match their programs for change with an updated library of print collaterals. The new print materials needed to capture their brand's fun and community-focused values. Working together with DrawHistory, we further positioned them as playful, energised change-makers ready to create new life-long connections. The idea was to reframe and design the information presented, rethink its content and involve the people that made the Befriend what it is today.